Yes, I'm drunk. And you're beautiful. And tomorrow morning, I'll be sober but you'll still be beautiful. As a creative, I find the idea is always the key and the means to do it is a secondary matter. Because of the nature of The Dreamers – its plot and timing – I wanted this sequence to look organic, just like in the old days. So I just started piecing visually abstract elements together, like in a puzzle, and decided to completely abandon any complex animation effects. It just did not fit in with the essence of the movie. To preserve that ‘old school’ feel I worked as if everything was completely optical. You see, in the past you just could not see things in real time. And this had a tremendous impact on your pace of work, accuracy, thought process, and the whole approach really. You had to be a better planner. You had to be a master of accuracy. Everything you were doing was in real scale – very physical. You could not just press ‘delete’ and start over. By creating this sequence in this way I really had a genuine belief that this would actually work. Luckily, it did. And so the main idea I applied was to use the Eiffel Tower as the background – for the interaction of the tower’s 3D shapes with graphically explored elements such as the typeface and colours. This, combined with the application of a continuous vertical camera pan, produced something of a lasting and very specific effect. 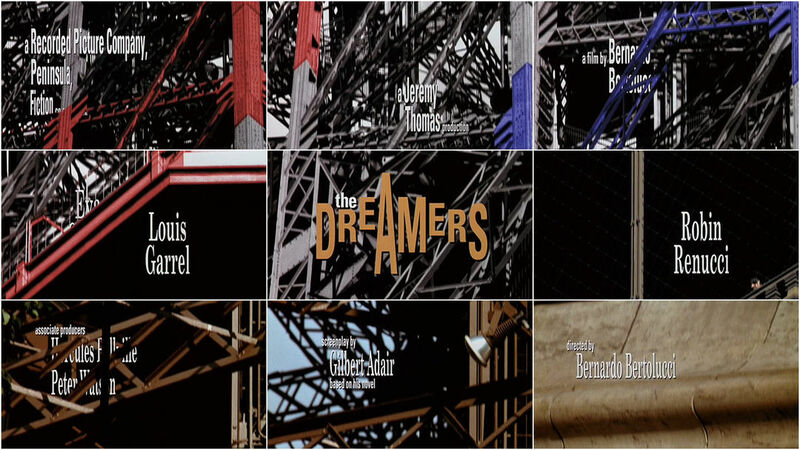 I think most people now recognize The Dreamers just by that quite memorable title sequence.